The cold weather, has now been replaced with spring like temperatures and the trout have been moving near the surface and taking the odd buzzer. Catches have been slow still, however there have been a few nice fish taken. Hawkshead Angling Club member Dave Bell landed a nice brace of Brown Trout, that were successfully released on legered worm from the ticket office banking. Dave’s best fish was a cracking 3lb+ fish. Meanwhile John Brown from Lancaster fly fished fry patterns from the boats and took 3 nice rainbows to 4lb from the South basin. The lake will receive its first stocking of the year on March 1st, so expect sport to pick up no end. The mild winter has had a positive effect on the over wintering stock and so prospects for March are looking very good indeed. Our open day will take place on Sunday March 11th. The day will include heat 1 of Esthwaite Pairs competition. There will be a discounted tuition session running from 10am until 2pm. The cost for this is £10 per person, anyone is welcome, just remember to bring a hat and a pair of sunglasses. Each participant will need an EA licence, which will need to be purchased in advance of the day. There will be a fly tying demonstration, conducted by the England Youth squad members and you can learn how to tie that ‘hot’ Esthwaite pattern. Also special offers on fishing tackle and complimentary food and drink will be available, as well as general camaraderie. Feel free to come and chat to our friendly staff, everyone is welcome. Please contact the fishery for further details! The Pike fishing has been on top form since the thaw and static deadbaits have reigned supreme for the majority of anglers visiting the fishery. Meanwhile Mark Jones from Colwyn Bay employed the guiding service available at Esthwaite and took 2 Pike to 20lb 8oz, again on static deadbaits from the boats. Peter Bragg from Whitehaven took a 22lb fish on Mackerel deadbait. Chris Harris lure fished and landed a 20lb 8oz fish, again from the boats! Paul White from Carlisle used smelt to land a 21 pounder. H.A.C member Dave Roscoe took a 19lb 4oz fish to similar tactics. Meanwhile Ian Spence from Barnard Castle fished a static deadbait and landed a 21 pounder. James Goodall from Grasmere took a 25lb 10 oz fish to legered mackerel ( see attached photo) and Mark Billington from Sedbergh fished with an Esthwaite guide and took a cracking 24lb 8oz fish (see attached photo). Don’t forget the Pike season runs until the end of March, please telephone the fishery in advance to reserve your boat, tightlines! With the colder weather kicking in, the trout fishing has slowed some what since the exceptional sport we experienced prior to the new year. However one or two fish have been reported on worming tactics. Hawkshead Angling Club member Dave Bell from nearby Windermere fished legered worm next to the ticket office and landed a fine Brown Trout of 2lb+, which was safely released. Meanwhile Kate Watson another H.A.C member from Burton in Kendal fished bubble float and worm and took a beautiful 3lb 10oz rainbow. Don’t forget the fishery will receive its first stocking on March 1st and our open day will take place on Sunday 11th March and will include the usual camaraderie of the first heat of the open pairs and a discounted tuition session in the morning. There will be a fly tying demonstration conducted by two members of the England youth fly fishing team and they will be offering practical tips and you can learn how to tie that ‘hot’ Esthwaite pattern. Also there will be special offers on fishing tackle and complimentry food and drink will be available. Feel free to come and chat to our friendly staff, everyone is welcome. Contact the fishery for further details. Hawkshead Angling Club, which is affiliated with Esthwaite Water is now recruiting for the 2012 season. Membership fees are £135 for adults and £31 for juniors. There is now NO eligibility boundary, so anybody can join, it is no longer restricted to locals. For those who want to take up this fabulous offer, please contact the secretary Dave Armstrong on 01946 691889 or email mrdarmstrong@sky.com. Members benefit from a 60% discount on boat rental. Well what can I say, the pike fishing has been fabulous recently with a number of leviathans reported. First up Robert and Tom Clarke from Fleetwood employed deadbaits from the boats to take 3 pike up to 10lb. Mike Atherton from Blackpool also deadbaited and took a 16lb snapper. Warren Hessey from Blackpool took an 18 pounder, again fishing deadbaits from the boats. Meanwhile John Ashurst from Wigan also landed an 18lb 12oz fish from the boats, again static deadbait was the key! Venue regular Dave Roscoe from Bury took a string of fish with boat partner, young James Macdonald aged 11. They also deadbaited from the boats and landed 4 doubles to 17lb and a 21 pounder , a 22 pounder and a 23lb 8oz specimen respectively! (see attached photo). John Lodge from Colne in Lancashire fished the ticket office banking on day ticket and took this pb pike, a 28lb cracker. This one fell to a mackerel tail. ( see attached photo ). However I always save the best until last! Feast your eyes on this Lake District lunker of 30lb 4oz to Nick Stopford from Kendal. ( see attached photo ) He enjoyed a fine afternoons deadbaiting from the boats and his mate Graham Mclean also took a 21 pounder to round off. The coarse fishing is still good. Martin Winward from Barrow has been getting 10lb+ bags every visit and 18lb 8oz of roach and perch on his last visit. 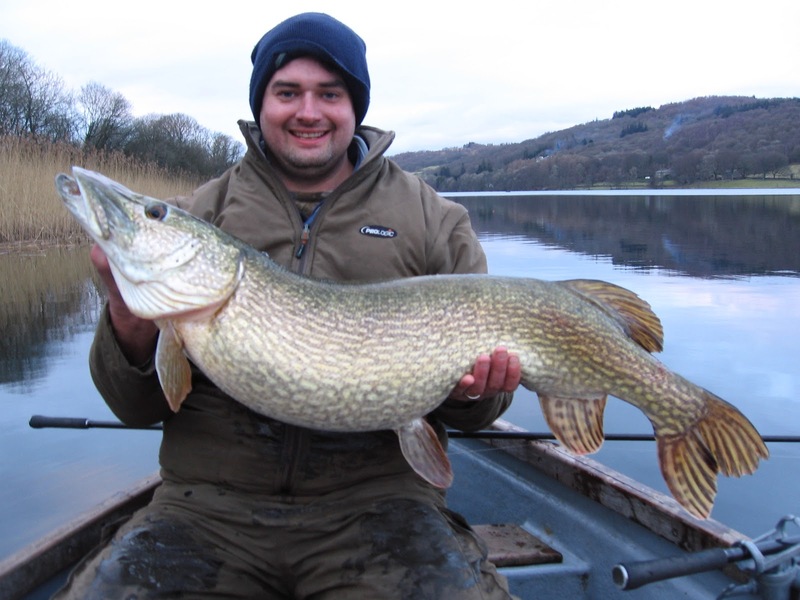 Remember our pike season continues until the 31st March and our general coarse fishing continues until the end of February. Please contact the ticket office on 015394 36541 to reserve your boat. Or log onto our website www.hawksheadtrout.com for all other information required.